Shinokubo Field Mustard & Sakura (篠窪菜の花・桜祭) is a flower festival happens at Oi Town, Kanagawa Prefecture. This site is known as a great Mt. Fuji viewpoint. 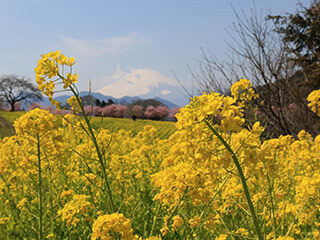 Around the middle of March, you can enjoy the beautiful Cherry Blossom and Field Mustard with a stunning view of Mt. Fuji. The yellow field of flowers and pink cherry blossom are the great harmonies of Japanese Spring Beauty. Of course, Mt. Fuji will be so beautiful with those natural decorations. There are a parking and restroom. Time: From the middle to the beginning of April. 1. use JR Gotenba Line to Sagami-Kaneko Station. Shinokubo Field Mustard & Sakura festival is held at Hokaen garden located in Oi Town, Kanagawa Prefecture. It is known as one of the best Mt. Fuji viewpoint in Kanagawa. From the middel of March to the beginning of April, beautiful Sakura and Nanohana will bloom. On the weekends during the blossom season, there are many events held at this field. There is a shuttle bus during the events from Odakyu Line Shin-Matsuda Station.